We make no claims to make these lovely lockets , unlike the rest of the jewellery on our website. Instead these are made for us by a small company in mexico. This locket is sterling silver and double sided with a scalloped edge to the silver , so each locket will hold two pictures and unscrews easily from the top so you can insert your favourite pictures. Luckily these fit our ROSA necklaces perfectly, so you can keep your favourite keepsake pictures with your favourite charms. 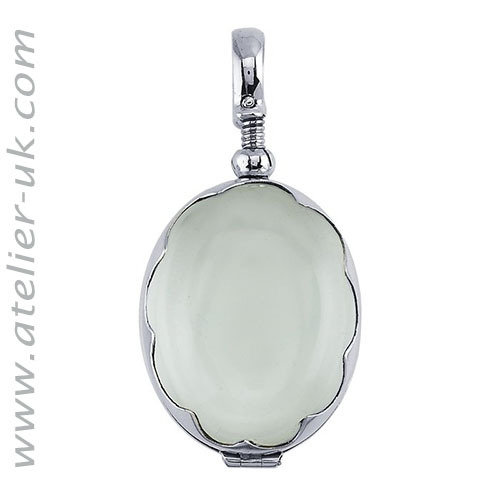 The oval locket measures 27 mm x 22 , and unlike some versions of this locket you'll find on a well known gift website , there come with lovely traditonal glass fittings , not perspex ( whch scratches easily). The glass fittings in these also give them a satisfying weight and feel. You can also insert favourite tiny pictures , quotes or poems if you don't want to utilize photographs.